B-day bliss! Frosting galore! Grandma made a cake; now it is time for some destruction. Hey thanks for the comment! My daughter likes to take off the keys from our laptop too. She took the shift key off and now it no longer works. 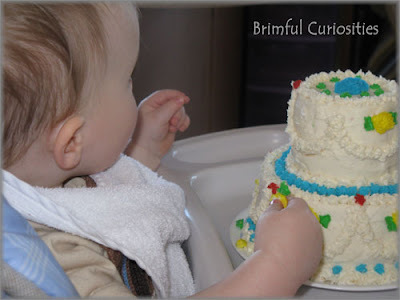 So did you see my post about sugar-free frosting? I'm making some for my daughter on her birthday. I'm giving her normal cake but wanted to cut back on some of the sugar. I also already tried the frosting and it's sooo yummy. Just an idea for next time if you are interested! It looks yummy!!! I bet it won't last long!! Yum. Beautiful cake. Next week you should post the after photo. Oh boy - I think I know what comes next. Hope he enjoyed the cake. Great pic! Pretty cake too - I wish I knew how make frosting/icing decorations like that. Happy Wednesday! That is a great looking cake! Yum! That cake looks so delicious and I'll bet it was! I love when we let them just go after it with their hands. It's the best! Wow. Grandma made that cake? It's gorgeous! Birthday photos are my favorite. It looks yummy (and beautiful). I'm sure the after shot was drastically different! That looks like the best first birthday cake ever to destroy. Yum! WOW Grandma did a great job......now I want cake! I love that first birthday and all of the icing that goes with it. Thanks for sharing. Ooooohhh! I can't wait to see the AFTER pictures! What a beautiful cake to destroy and enjoy! Happy WW! It's a lovely cake, kind of sad to see it destroyed. But that's the fun of birthdays! I bet he loved it. Oh I love it. We are having a first and second bday party in April. I bet my youngest would love that cake! The cake is absolutely spectacular! How long did it last? Great picture. I love the profile shot. What a sweet picture (no pun intended...lol) and what a beautiful cake!! Happy WW!! Your mom made that? That's pretty impressive! What a fabulous 1st birthday cake. Did a lot end up in the mouth or all over the place? That is always the "fun" part of those days. Yum, that looks like some tasty fun! Cute! Next time please post the aftermath, lol. Look like a first birthday. The cake looks so yummy. I bet baby had a great time making a mess. My little one always loves being the first one to dip her finger into the frosting. Thanks for sharing this adorable photo.